Yaya Toure says Premier League champions Manchester City have something to prove when they face league leaders Chelsea on Sunday. City, who lost 1-0 to Bayern Munich in the Champions League on Wednesday, trail Chelsea by five points ahead of the game at Etihad Stadium. 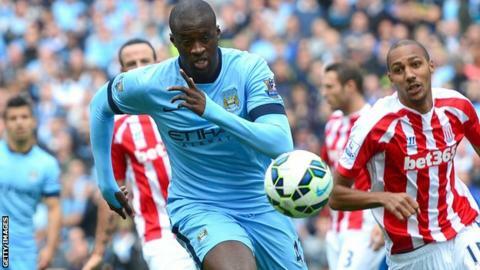 "We want to close the gap on Chelsea and need to win on Sunday," Toure said. "It is going to be really important to prove that as a team and as a club that we are growing every day." These are the two outstanding teams in the Premier League and I am a little bit sorry that this game has come so early in the season - ideally, you want to see them meet near Christmas and then in May, not September and January. Chelsea have begun this season in ominous form, winning all four of their league games and scoring 15 goals in the process, while City have been inconsistent, dropping points at Arsenal last weekend and losing at home to Stoke. in their previous game. It is this form that led BBC Sport columnist Robbie Savage to warn that City risk repeating the mistakes they made under Roberto Mancini, when they failed to improve their squad following their title triumph in 2012 and did not retain their crown. Speaking to Football Focus, Ivory Coast midfielder Toure added: "Chelsea are a top side who a have a great shape and are in form. "We know it is going to be very tough because Chelsea have a strong squad and good players and are hungry to win trophies. "We need to work hard as a team and try to do the business on Sunday and bounce back from the disappointment against Bayern Munich. "We know it is going to be tough this year. We won the Premier League last season but that is now in the past and we have to focus on improving and being more consistent. "It's difficult because a lot of our important players have not had enough rest and recovery after the World Cup. "As champions we want to win it again so we have to work hard because all the other teams are going to come at us and try to beat us. We need to deliver." New signings Cesc Fabregas and Diego Costa, who has scored seven goals in five appearances, have improved a Chelsea side that finished third last season, four points behind City. The defending champions are seeking their first league win in three matches; failure to beat Chelsea would represent their worst run for 19 months, when they earned only two points out of a possible nine. City dropped only five points at home last season, winning 17 of their 19 fixtures and registering a league-high 52 points. They have already lost to Stoke this campaign. But Sunday's game represents the biggest test of the title credentials of Jose Mourinho's side, who did the double over City last season, winning 2-1 at Stamford Bridge and 1-0 in Manchester. The Portuguese, however, does not feel previous results will have any bearing on this weekend's match. "What happened last year and seasons before I don't think has a relation to this season," he said. "It's a completely different story. "It doesn't matter the record we had last season against City. We respect them totally, because they deserve that respect, but at the same time we believe in us and we want to win. "Can we go there and win like we did last season? Obviously we can, but can we lose? We also can. And I don't think statistics play a part in this. "I want to win this game to get three points. I'm totally focused on three points and the Premier League 2015, rather than history."